This lesson is part 2 of the previous lesson. I will show you many different examples on how to use ～てあげる, ～てもらう and ～てくれる for giving and receiving of "actions" (deeds). Depending on the verbs used for the actions, you will also learn what are the specific particles used in these examples. Let's check out the sentence patterns for ～てあげる, ～てもらう and ～てくれる. Note: Used when a person does something beneficial to another person. When "私" is the subject of the sentence, it may give the impression that the favor is being forcefully imposed. So be careful when using it. Note: Used when a person feels grateful towards a person who has helped him/her. Note: Used when a person who has asked for help feels grateful towards the person who helped him/her. You will see that for ～てあげる and ～てくれる sentences, the person who receives the assistance can be marked by particle に, の or を, all depending on the verbs used. This is the most difficult part when using these sentence patterns as many of you always get confused about which particle to use. To determine which particle to use, you have got to understand the verb involved in the sentence. Most verbs are tied to specific particle. To help you on this, I will show you about 20 verbs together with some examples. Memorize the formats of all of them if you need to. This will help you determine the correct particle once you see similar verbs. Meaning: I show the photos to my friend. In the above example, the Giver is 私 (the speaker), the Receiver is 友達. Since the Giver is 私, you cannot use the ～てもらう sentence. Therefore the following example is not accepted, although grammatically there's no mistake. 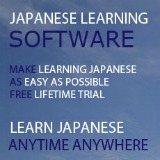 教える (oshieru) means to teach, to inform, to tell. 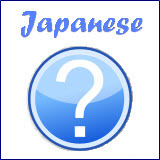 Similar to the previous example the format is "Person に Noun を 教える". Giver is 先生. Receiver is 私達. Meaning: Teacher taught us Japanese. 貸す (kasu) means to lend. Format is "Person に Noun を 貸す". Giver is 兄. Receiver is 弟. Meaning: My elder brother lent money to my younger brother. 譲る (yuzuru) means to hand over, to transfer, to relinquish, to give up. Format is "Person に Noun を 譲る". Giver is 田中さん. Receiver is お婆さん. 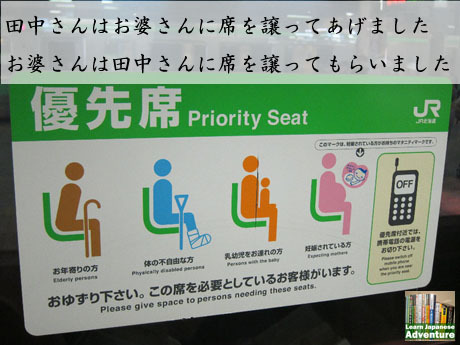 Meaning: Mr Tanaka gave up his seat to the old lady. 作る tsukuru) means to make, to create. Format is "Person に Noun を 作る". Giver is 母. Receiver is 私. Meaning: My mother made a meal for me. 買う (kau) means to buy. Format is "Person に Noun を 買う". Giver is 父. Receiver is 妹. Meaning: My father bought ice-cream for my younger sister. 迎える (mukaeru) means to welcome, to greet, to meet, to pick up. Format is "Person を 迎える". Giver is 家族. Receiver is 私. Meaning: My family picked me up by car. 送る (okuru) means to send (a thing), to take (a person somewhere), to see off (a person). Format is "Person を 送る". Giver is 兄. Receiver is 私. Meaning: My elder brother took me to the train station. 待つ (matsu) means to wait. Format is "Person を 待つ". Giver is 水野さん. Receiver is 田中さん. Meaning: Mr Mizuno waited for Mr Tanaka. 誘う (sasou) means to invite, to ask. Format is "Person を Noun に 誘う". Giver is 山田さん. Receiver is 私. Meaning: Mr Yamada invited me for a dance. 招待する (shoutai suru) means to invite, to entertain. Format is "Person を Noun に 招待する". Giver is 友達. Receiver is 弟. Meaning: My friend invited my younger brother to the wedding ceremony. 連れて行く (tsurete iku) means to take someone (of lower status) along. Format is "Person を Noun へ 連れて行く". Meaning: My father took my younger sister to the department store. 掃除する (souji suru) means to clean, to sweep. Format is "Person の Noun を 掃除する". Giver is 母. Receiver is 妹. Meaning: My mother cleaned my younger sister's room. 洗濯する (sentaku suru) means to wash, to clean (laundry). Format is "Person の Noun を 洗濯する". Giver is 姉. Receiver is 私. Meaning: My elder sister washed the shirt for me. 撮る (toru) means to take (a photo). Format is "Person の Noun を 撮る". Giver is 木村さん. Receiver is 田中さん. Meaning: Mr Kimura took a picture for Mr Tanaka. 直す (naosu) means to fix, to correct, to repair. Format is "Person の Noun を 直す". Giver is 父. Receiver is 山田さん. Meaning: My father repaired the bicycle for Mr Tanaka. In this example, the Giver is 父 (My family) and the Receiver is 山田さん (Third person). According to the sentence pattern above, you cannot use the ～てもらう sentence in this situation. Therefore the following example is not accepted, although grammatically there's no mistake. 持つ (motsu) means to hold, to carry, to possess. Format is "Person の Noun を 持つ". Meaning: My elder brother carried the bag for me. 叩く (tataku) means to hit, to strike, to beat. Format is "Person の Noun を 叩く". Giver is 娘. Receiver is 私. Meaning: My daughter gave me a massage on my shoulder. 手伝う (tetsudau) means to help, to assist. Format is "Person の Noun を 手伝う". Giver is 妹. Receiver is 母. Meaning: My younger sister helped my mother for the dish washing. 運ぶ (hakobu) means to transport. Format is "Person の Noun を 運ぶ". Giver is 友達. Receiver is 私. Meaning: My friend carried (transported) the luggage for me. The actual meaning of a sentence with or without ～てあげる / ～てもらう / ～てくれる is the same, except that the former show that the Action Receiver is grateful for what the Action Taker has done for him/her. Another point to note is that for ～てあげる and ～てくれる sentences, the focus is on the Action Taker. Whereas for ～てもらう sentence, the focus is on the Action Receiver. For ～てもらう sentence, the Action Taker is always marked by the particle に. However, for ～てあげる and ～てくれる sentences, the Action Receiver can be marked by the particles に, の or を, depending on the verbs used. 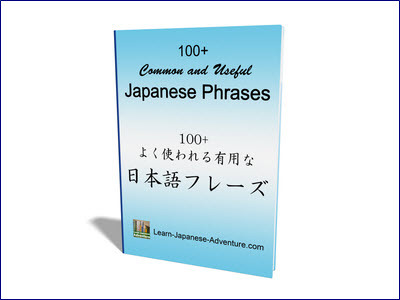 Basic Lesson 20: Japanese Verbs Give & Receive.